When we wrapped Logan's presents for his birthday we had ordered them so that a tricycle would be the last gift he opened. The Grand Finale if you will. He loves bikes and always wants to ride them and we were worried that once he saw it he wouldn't be interested in looking at anything else. We envisioned the excitement of his previous gifts would make the anticipation so great that when we brought out the final present he would screaming with joy (he does that) and our role as parents would be triumphantly validated. It's possible Tyson and I high fived over how awesome we are. No one will know. So that meant he opened a train set before the trike. He loves Thomas the train. He wanted Thomas opened right then. He showed Thomas to everyone. He would have been done after Thomas. But the CHAMPION PRESENT would be better! We knew it. When it came time to open it I had the regular camera and video going to capture his moment of delight and joy upon unveiling The Finale. And maybe even his first unprompted "thank you"? A mom can hope. 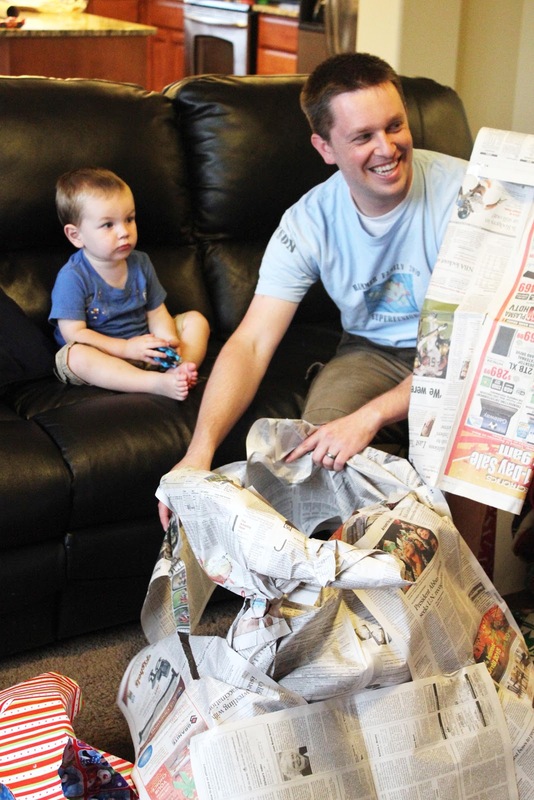 Tyson brought out the carefully wrapped present (sometimes we wrap birthday presents in Christmas paper and newspaper, not a reflection of our love and devotion to the recipient) and set it in front of Logan. "What do you think it is, buddy? Tyson asked as he lifted up the paper to reveal a wheel. Logan's monotone and uninterested reply after tearing his eyes away from Thomas. He did give his bike a whirl that night and has enjoyed many rides since but man, he loves those trains. oh, that's sad yet funny about the bike! Lesson learned--kids never do what you think they will. on jonas' 4th birthday he opened this gone that my friend bought him from the dollar store first and fell in love. he went through the rest of his presents like someone digging through a dumpster, chucking stuff behind him. i was embarrassed!